At the RESNA (Rehabilitation Engineering and Assistive Technology Society of North America) conference, doctors presented a paper calling independent mobility crucial for infants. “Children with physical disabilities and restricted mobility have been found to demonstrate increased dependence, frustration, depressed motivation, lack of curiosity, and a lack of confidence,” they wrote. These doctors recommended that babies should take to driving robots enhanced with sonar capabilities. They created a baby robo-chair by placing the baby into a baby seat that is strapped onto a Wii Fit Balance Board that sits atop a Pioneer 3 robot platform. This ingenious invention works for even 7-month-old infants as the robot will travel in whatever path and direction in which the baby leans. The built-in sonar keeps babies safe by avoiding collisions. 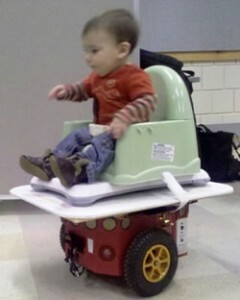 Since each child moves in a different way, the robo-chair can be customized. Parents or therapists can use a wireless joystick as a master override switch if needed. I thought this was a great story! Please write more like these!